What I liked about the previous two issues was definitely the personal focus on Khan. We got to see how he turned into the man he was during the Eugenics Wars and how he removed each and every obstacle in his way to his success, success that he thought he deserved, that he believed was his birthright because of his innate genetic superiority. With this issue Johnson takes a few steps forwards and he goes for a wide focus and shows us the state of the world itself during the Eugenics Wars and what the different “superior” tyrants were doing in their various power blocs. The wide approach didn’t work out that well for me, and I was somewhat disappointed by the perfunctory nature of it all. My problem with this issue also lay in Khan’s characterisation. Like the previous issue, this one is all narration and little substance to go along with that. Thus we see that things happen to Khan as an audience removed from the proceedings. We are not in there right with the character and seeing things through his perspective. There’s very little of that in this issue and this was a major failing since I wanted to see how Khan reacts to things around him. That sort of detachment with the character is doing nothing but hurting the character in the long run. Another problematic element was that the pacing is off. In the last issue, Khan and his fellow Eugenics got started on establishing their distant heroes. In this issue, we get an extremely brief intro to Khan’s rule over India and various parts of South-West Asia and Eastern Europe, then we launch into a history lesson as the planet destroys itself. It all seemed very filler to me, like Johnson wasn’t sure what to do in this issue and so he just crammed tons of world-building here, but in a very unemotional way since there was no lasting impression of any of it on me. And that’s truly where I would lay most of the fault of this comic. I expected more out of it, but none of it really came about. Speaking of the art, the team is largely the same, except for the addition of Luca Lamberti on most of the flashback pages. For some reason, the art in this issue is less defined than what we saw in the previous two issues. It appears to be much simpler, and many of the characters are not as easily recognisable as they were before. I’m not sure what exactly is going on here with this comic, but the art is slowly losing steam and I find that to be very disappointing, given that this is a tie-in to one of the most financially successful movies of the year. Ultimately, its all a combination of factors, in terms of both the story and the art alike. There is very little to like here, which is significant since the previous two issues were enjoyable on some level. But that is not the case here at all. 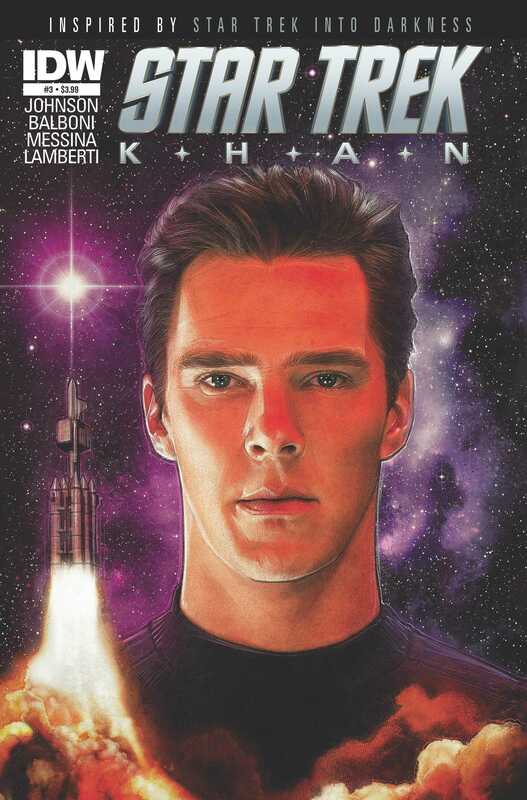 Star Trek: Khan #3 was barely enjoyable and right now Johnson & Co are flirting very close to the line where I decide to drop a series. This title needs to improve considerably in the future issues. Posted on December 4, 2013, in Comics Reviews, Review Central and tagged Claudia Balboni, Claudia ScarletGothica, Comics, Comics Review, David Messina, IDW Publishing, Khan, Khan Noonien Singh, Marina Castelvetro, Mike Johnson, Neil Uyetake, Review, Review Central, Science Fiction, Space Opera, Star Trek, Star Trek: Into Darkness, Star Trek: Khan. Bookmark the permalink. 6 Comments.